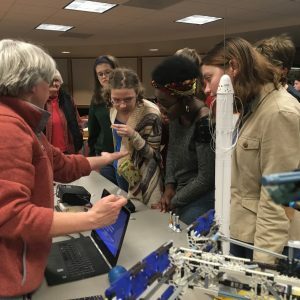 Our Southeast Ohio Teen Science Café is relatively new – we just hosted our first café in January of 2018. We are located in Southeast Ohio, in a university town surrounded by beautiful woodsy hills and streams. 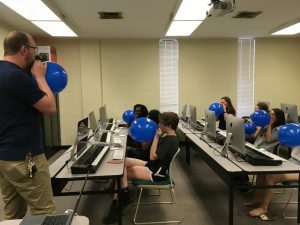 We are in the unique situation of living in a region that provides many STEM and STEAM (STEM+arts) opportunities to its residents while still facing challenges common to many who reside in Appalachia (poverty, the opioid crisis, etc.) Our teen leaders are interested in a wide variety of STEAM topics and are active in their school and throughout the community. 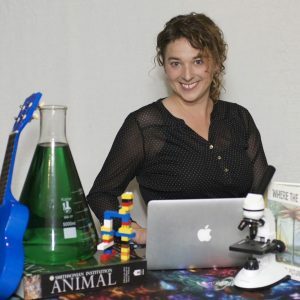 My background is in music education and I have taught middle school through college music students, but I have also always had a love for science and technology. I’m currently the director of a STEAM-based discovery museum and a PhD student in Instructional Technology, so I’m always seeking out ways to incorporate all my interests. I would say my educational heroes are Mr. Rogers, Ms. Frizzle, and Leonard Bernstein! After hearing about the Teen Science Café Network, our museum board was enthusiastically supportive about getting a café started here in Athens. The Ohio Valley Museum of Discovery (OVMoD) is our home organization. This STEAM-based, hands-on discovery museum is working to provide visitors and community members of all ages with interactive experiences and programming to spark their interest and to help them discover something new about the world around them. We are not exclusively a children’s museum, not necessarily a science center, but we draw a lot from those two worlds. While OVMoD is busy fundraising for significant building renovations, our Teen Science Cafés are meeting in the Athens County Public Library. I feel as if the cafés are another way to provide our community with connections to the scientific world, as well as extending the range of ages that the museum serves. While it is always challenging to find funding sources to create sustainable programming that matches our dreams, one obstacle we faced this year was bringing in new students to our cafés. We’re experimenting a little more with social media and connecting with local teachers to get the word out. The teen leaders are also discussing the possibility of making our café a little bit more mobile to try and reach more teens throughout the region. I’m going to break the rules here and say that I have two favorite cafés. The first was presented by Dr. Wyatt of Wyatt Lab at Ohio University. She had great visuals to illustrate how her plants traveled to the International Space Station and were used in her studies about the effect of gravity on plant growth. She also spoke to our teen leaders about her experiences as a woman in a male-dominated field and offered encouragement to keep going, challenging the status quo! My other favorite was a café about the physics of music where we were joined by Ohio University music composition faculty, Dr. Robert McClure. He brought some fun interactives (balloons!) and the teens had a great time playfully exploring musical timbre. 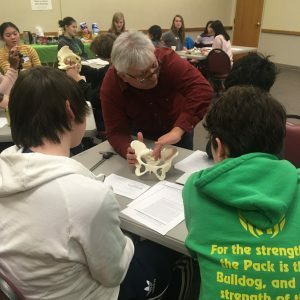 The students I work with are incredible – they are intelligent, engaging, and could choose a million other activities, so I’m honored that they choose to spend their time helping to bring the teen science café to life. I view the importance of the ‘dry run’ as a way for teens to guide the presenters through feedback that can make their presentations more interesting, interactive, and relevant to the students themselves, despite the fact that it does take additional time. It can also be difficult as a mentor to step back and let the students take over running an event, especially if it means letting them fail a little. I think that the ownership they feel of the group is really important if it is going to succeed as a “by-teens-for-teens” venture.